Interested in selling into Menards? Come to our Menards Buying Day: August 4th 2016 – Registration will open soon. In the meantime check out our YouTube channel and learn more about Menards here! In Toronto today to help an Eastern European supplier begin discussions with Home Depot here in the Great White North. One key point to remember when approaching overseas business is that often times, direct container FOB is not the only way to get started. If distribution is needed and the retailer isn’t inclined to take the inventory risk, it’s often possible to work with an existing distributor on a cost-plus arrangement to solve the issue. 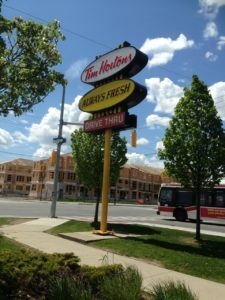 Another key thing to remember in Canada is how much they love their Tim Horton’s. This one is just across the street from the innovation center so had to stop in for a pre-meeting high octane coffee.